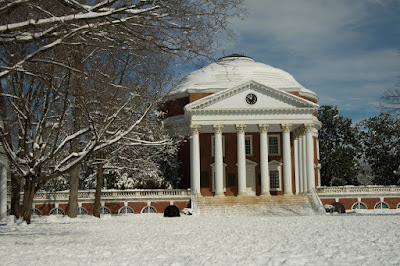 Just look at it: Mr. Jefferson's University is both historical and beautiful. The catch with historic is that accessibility for everyone has only recently come to the forefront of the public's prerogatives. So what does that mean for UVa? How does well Mr. Jefferson's University fare in that arena? McCormick Rd is the main line running through Central Grounds. It connects the Amphitheater/ Lawn/ Cabell area to the Engineering School and then all the way to Observatory Hill Dining Hall. I have seen sleet, hail, torrential rain, and snow pound down on Charlottesville during class time. I have seen snow cleared and salted very quickly. Sometimes I have seen accidents where snow piles have been put too close to handicap ramps or accesses, but usually, that doesn't happen. Water draining poorly only happens in a few places, though it can be deep (more than 4 inches) where there are problems. This fall I sprained my left hand such that I was in a cast for 7 weeks. I have several friends who regularly use wheel chairs or have been in arm and leg casts and on crutches. Basically, people being in need of a conscientious design is not an unusual nor novel situation. I was disappointed at how difficult it was for me to use even the new machines. For example, the dining halls just put in new hot water containers so that more tea can be ready at any given time. That's great, but the old one involved pulling a short lever. The new unit requires the user to push a button at the top of the machine, and water comes out near the bottom. It's impossible to do one handed, unlike the old system. That said, the drinks and the hot water were my only real complaint. Almost everything else was very good. They have elevator keys if stairs are a problem. Walkways are wide and kept very clear, and automatic doors are available at entrances. On the plus side, I was overwhelmed at how wonderful other students were. They immediately offered help with the hot water and opening doors. It really was a bonding experience, and I felt more like I was home than with a crowd of likeable strangers. Whoever handles classroom and library equipment, they are phenomenal. You can request a certain kind of desk in a particular location at any time during the week, and they will move it there every time it's needed. They are awesome. Broke your arm and can't take notes? Not only will professors ask for volunteers, but the Learning Needs Center will supply you and your helpers with carbon notebooks so that while they write their notes, a duplicate set is made for you. Even something like needing a left handed desk--they will take care of it, make sure that you're doing well, and what you need stays where you want it. I give UVa a solid B on the cusp of a B+. They're working with a very hilly location and historic buildings that can be difficult to convert. There is a way to get to almost anywhere. The reason I say almost is that the Gooch/Dillard dorms are not handicap accessible on the upper floors. Everywhere else I can think of has a way to get there. It may not be pretty, but there's a way. The dining halls have some flaws, but UVa makes it clear that if you let them know of a way they can step up and improve the school or help you, they will. This is a village of scholars, and no one here wants anyone's studies to suffer, especially for something like accessibility. The University has 4 schools one can apply into directly: the College of Arts and Sciences (CLAS), The School of Engineering (E School), School of Architecture (A School), and the School of Nursing. Later, students may apply into specialty schools like Education, Commerce, and Public Policy. *Note: for UVa, apply the initial school of which you want to be part. 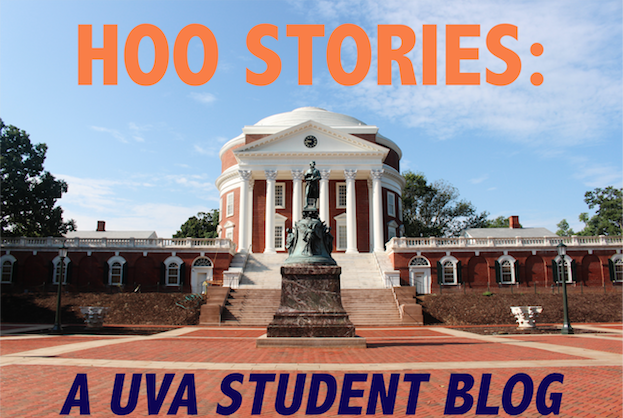 For example, nurses do not apply to UVa and then to the nursing program. Some schools do that; we don't. If you look closely, there are some areas of overlap in between the College and E School, particularly in computer science. Since CS is often the biggest area of debate for E School versus the College, that is where I want to focus.